In just 30 years, mobile telephony has grown into a major global industry, with an estimated 5 billion users around the world (compared with a total world population of just under 7 billion people). While new subscriber growth has slowed somewhat in recent years, product turnover remains high, with over 1 billion new mobile phones shipped in 2009 alone. As a result of ever-advancing technology and product obsolescence in this market, it is estimated that some 300,000 mobile phones are sent to the trash every day in the United States alone. 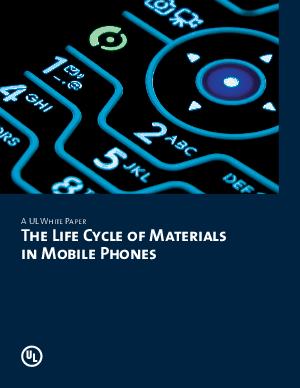 This white paper examines the overall environmental impact of materials used in mobile phones, from the extraction of raw materials and component manufacturing required to produce the latest models, to the appropriate recovery and recycling of these products at end-of-life (EoL). While the scope of this paper is limited to mobile phones, similar materials are used in many other high technology products, including personal computers, portable entertainment players, and other types of information and communications devices. Energy consumption and radio frequency emissions at the product level are outside the scope of this paper.